Strong growing bushy evergreen sub-shrub. Long spikes of small white flowers, tinged lavender and with conspicuous dusky purple bracts, giving a bicoloured appearance. Very free flowering from late summer into autumn. Well drained, prefereably alkaline soil in full sun. Rather tender and needs a fairly warm location. 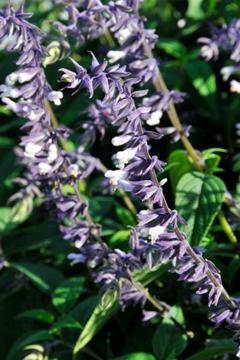 A possible hybrid of Salvia leucantha x Salvia chiapensis, raised at the University of California, Santa Cruz. Named after Phyllis Norris.